In 1953, British researchers discovered that drivers of London’s double-decker buses were more likely to suffer a deadly heart attack than the more physically active conductors (1). Another study published five years later found that the risk of heart attack was higher among government clerks than postmen (2). These studies laid the foundation for the hypothesis that men in physically active jobs were at lower risk of heart disease than men in physically inactive jobs. Hence, it was proposed that a sedentary lifestyle increased the risk of heart disease. Since then it has repeatedly been shown that regular physical exercise is associated with a lower risk of premature death, coronary heart disease, certain types of cancer, and diabetes. Physical activity has also been shown to improve mental health. The World Health Organization (WHO) recently recognized physical inactivity as one of the leading global risk factors for morbidity and premature mortality (3). However, several questions remain. What type of exercise is most likely to improve our health? Should we walk, jog, lift weights or all of those? And, is there an easy way to assess or measure our physical condition? Physical fitness consists of cardiorespiratory fitness and muscular fitness. The American Heart Association (AHA) recommends aerobic exercises for the benefit of the heart, including walking, jogging, swimming or biking and strength and stretching exercises for overall stamina and flexibility (4). However, strength training may have wider implications for general health than previously thought. A growing body of evidence suggests that muscular strength is inversely and independently associated with death from all causes, after adjusting for cardiorespiratory fitness and other cofactors such as age, body fat, smoking, alcohol, and hypertension (5). A narrative review of studies addressing the role of muscular strength as a predictor of mortality was published by German investigators in 2015 (5). Fourteen epidemiological studies fulfilled the study criteria, and all reported that an increased level of muscular strength was significantly associated with lower all-cause mortality. The same pattern was observed for cardiovascular mortality. The existed studies failed to show that low muscular strength was predictive of cancer mortality. Grip strength is a simple and inexpensive measure of overall muscular strength. Grip strength is a simple and inexpensive measure of overall muscular strength. It is usually performed by a Jamar hydraulic dynamometer which can measure isometric grip force with excellent reliability and reproducibility (6). The Prospective Urban-Rural Epidemiology (PURE) study is a large, longitudinal population study done in 17 countries of varying incomes and sociocultural settings. Participants in the study were assessed for grip strength. The results of this part of the study were published in Lancet in 2015 (7). Over a median follow-up of four years, low grip strength was associated with all-cause mortality, cardiovascular mortality, non-cardiovascular mortality, myocardial infarction, and stroke. 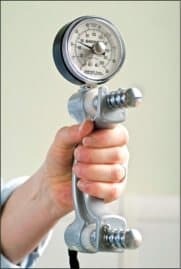 Low grip strength was a stronger predictor of all-cause and cardiovascular mortality than systolic blood pressure. It has been suggested that grip strength might act as a biomarker of aging across the life course (8). The findings from the PURE study certainly suggest that skeletal muscle function is an important component of health, aging, and longevity. Although we are in the midst of an obesity epidemic, focusing on body weight and body mass index (BMI) may be misleading. Of course, there is data showing a strong association between excess adiposity and increased risk of cardiovascular disease and early mortality (9). However, substantial evidence suggests that greater aerobic fitness can lower the risk of cardiovascular disease and death associated with obesity. In a meta-analysis published 2014, overweight and obese-fit individuals had similar mortality risks as normal weight-fit individuals (10). Hence, the role of physical exercise for the treatment of obesity should not be downplayed (11). A recent study tested the association between grip strength, obesity, and mortality (12). Data from 403.199 participants in the UK Biobank study were used in the analysis. The median follow-up was seven years. Overall, greater grip strength was associated with an 8 percent lower risk of mortality. In contrast, adiposity measures had an inconstant association with mortality, although severe obesity (BMI>35) and abdominal obesity were strong predictors of mortality, independent of grip strength. The mortality risk was highest for men and women with the lowest grip strength and the highest obesity measures. Interestingly, obese individuals with greater grip strength had a lower or similar mortality risks compared with nonobese people with lower grip strength. Men and women with greater grip strength had lower risks of mortality, independent of adiposity. Although excess adiposity per se presents a substantial risk of mortality, the risk associated with excess adiposity was reduced, although not completely eliminated, through greater grip strength. Overall, the findings provide compelling rationales for developing interventions and policies to improve muscular strength and reduce excess adiposity to minimize mortality risk. The association between grip strength and mortality does not provide proof that strength training improves health and longevity. Although the available epidemiological data is reliable, it cannot tell whether a causal relationship exists between muscular strength and mortality. Obviously, randomized trials on the effects of strength training on mortality are difficult to perform. There would be a high risk of crossover between the groups. Furthermore, an extensive study would be needed to confirm whether or not there is a mortality benefit or not. In a paper published 2016, US investigators found that among a large cohort of adults aged 65 or older, all-cause mortality was significantly lower among individuals who performed regular strength training (13). This was true after correcting for confounding factors. Hence, older adults who perform strength training not only improve their physical condition, but their survival rate is improved as well. However, just like other cohort studies, this study has limited ability to determine cause and effect. There may be several reasons why strength training and grip strength are associated with longevity. Resistance training can counteract the age-related decline in muscle mass and strength (sarcopenia) which is characterized by a decrease in contractile protein and excessive intra-an extracellular lipid accumulation (14). Strength training also improves neuromuscular coordination and balance. This may reduce the risk of injuries from falls which often provide serious health threats to elderly individuals. 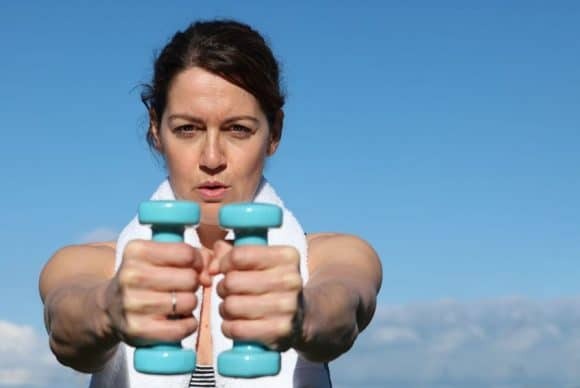 Furthermore, resistance training increases bone mass and mineral density and lowers the risk of osteoporosis which is a global public health problem. There is evidence that skeletal muscle in many ways acts as an endocrine organ. Skeletal muscle cells produce cytokines (myokines) that may help to fight inflammation and maintain normal body function. Hence, myokines may contribute to exercise-induced protection against several chronic diseases (15). Strength training may also improve cardiovascular risk factors such as blood pressure, blood lipids and insulin resistance. There is overwhelming evidence that muscular strength and strength training are associated with several health benefits and increased life expectancy. Older adults who perform strength training not only improve their physical condition but their survival rate is improved as well. Obese individuals with greater muscle strength have lower risks of mortality, independent of adiposity. Resistance training counteracts the age-related decline in muscle mass and strength, improves balance and coordination, and reduces the risk of osteoporosis. Strength training may also reduce insulin resistance and improve blood pressure and blood lipids. Many of these exercises are a combination of aerobic and strength training. I’m assuming that both upper and lower body is important when it comes to muscular strength, longevity and general health. I’ve learned to not overdue it. As a healthy 52 year old, I maxed out my heart rate on my spinning cycle, and felt chest pains. Moderate exercise will lead to the longest life. Strenuous exercisers have the same lifespan as sedentary people. yes i have read the same exercise to a certain level is beneficial and beyond that increases inflammation and other markers.. i have put my long distance running days behind ! and opted for more short HITT typr body weight workouts retains muscle allows HR to vary and better on the bones! i think chronic cardio has gone by the wayside for the preferred path to heart health many knees and hips will be saved as well.! I can imagine that “training” your blood pressure response in this way could contribute to over-all conditioning and longevity. are those BP spikes harmful? I find that my PVCs and PACs, that are residual from a mostly successful atrial fibrillation ablation a few years ago, are worse the evening after a satisfying workout. Electophysiologists say that high BP is a prime risk factor for AF. Exercise. Harmful . . . or beneficial for the rhythm challenged? AF is quite different from PACs and PVCs in my experience. My paroxysmal episodes of AF all occurred during stressful physical work. My PACs and PVCs usually occur during down time, sometimes even awakening me. AF patients usually have enlarged left atria – a result of unrelieved high BP? It seems so. Of course, everyone is different. You get into trouble when you try to generalize too much. My resting rate before ablation four years ago was mid to high 50s. After ablation it’s in the high 60s. That’s often an artifact of ablation, apparently. So, I have no idea of this current HR’s significance with respect to my current ectopics. The last couple of years of diligent exercise hasn’t reduced that increase at all. Make sure to get 96 hours of rest between working out the same muscle group, this is not some opinion, its the chemistry. Inflammation takes more than 24 hours to subside. I work out the entire body twice per week, 4 days of rest in between minimum. Start with the BIG muscles (Chest and Upper Legs) finish off with the smaller ones (arms, lats, calves, etc.). Everything to failure. Type of exercise, weights or machine or weight levels do not matter, read more of Rogue’s scientific reports on that, effort is key! I am done in 30 minutes and I am sore for two days and in four days back to 100%. 100 workouts per year, in 50 hours! workout what is best for you, but the data is clear, any less rest wastes your time, any workouts when inflammation is present, is another waste of time and overloads your body. Wish I had this information when I was young. This is Gloria as per our conversation in the CANTOS trial discussion. I clicked reply there but the message cannot go through. Thank you very much for your kind reply yesterday, however there is no answer to QUESTION 1. I promise this will be the last questions and I am very thankful for your caring and kind guidance. In the very first email two weeks ago, regarding to your reply about the risk / benefit of taking of a statin, I forgot to mention that I have heart palpitations (about once in a month). The palpitations is very short duration (lasts for about 5 to 10 seconds) and when I am under stress I may have palpitations too. I don’t know if this is a serious risk factor. As a 67 year old female, taking into account my heart palpitations, a Calcium Score of 87, a non-HDL of 5.5 mmol/L and no other risk factors, You will not recommend me to take a statin? Is my risk for heart attack and stroke relatively low? Hypothetically, if my Calcium Score is higher than 87 at the age of 67 years old, and assuming that all of the above risk factors remain the same, You will prescribe a statin to me if my Calcium Score is 100? 150? 200? 300? 400? My Apo-B / Apo-A1 ratio is 0.65. With my Calcium Score of 87 and assuming that all of the above risk factors remain the same, You will prescribe a statin to me if my Apo-B / Apo-A1 ratio is 0.7? 0.8? 0.9? 1? 1.2? Sorry for the boring questions. The point of the questions is to see how much cushion I have. Thank you very much for your kind guidance and highly appreciated for your time and attention. I sincerely look forward to hear from you.